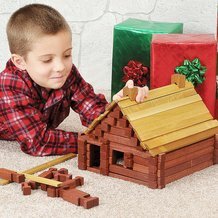 Cozy cabins, frontier lodges, even exotic castles and chalets - there's no limit to the variety of architectural masterpieces your children can build with these wooden logs. Genuine, wooden toys like those of past generations still encourage creativity, fine motor skills, problem solving and general enjoyment - all without batteries, computers and cheap plastic parts. Large set makes everything you see pictured with lots of pieces left over. "This set is great! 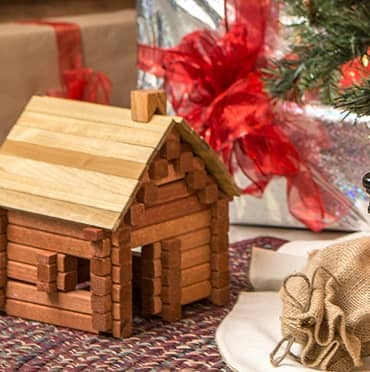 It is very well made, and the logs are sturdy. I got it for a 9 yr. old grandson and all the grandchildren ended up playing with it ALL day!..." "My boys (ages 7 and 4) absolutely love these! They got the large set for Christmas and they are out all the time. My only complaint is that I usually end up stepping on them (ouch!). Thanks for making a great product!" My wife and I decided to purchase the 303 piece log set for our 5 year old grandson's birthday. We figured the big set would be necessary, as it was likely the whole family would enjoy it. Sure enough, as soon as the box was opened, our grandson, along with his dad and three siblings, were all sitting on the living room floor building away. You can't miss with this one! By the way, there is absolutely nothing wrong with the quality of these logs. They're great! I purchased this product years ago and loved it. It was an excellent quality. I wanted to expand my kid's collection, so I bought another set a year ago for Christmas. The quality was poor. The edges of the logs were rough and it was inferior to the previous purchase. This set is great! It is very well made, and the logs are sturdy. I got it for a 9 yr. old grandson and all the grandchildren ended up playing with it ALL day! It was the biggest hit ever! Now the 7 yr. old wants a set for his birthday....how can I refuse??? Thanks for offering such a quality product. There is nothing else out there that can compete. My boys (ages 7 and 4) absolutely love these! They got the large set for Christmas and they are out all the time. My only complaint is that I usually end up stepping on them (ouch!). Thanks for making a great product! 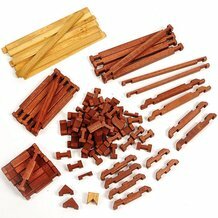 I have searched a long time for the Lincoln Logs like I had as a child, but none are the same, although some of the Lincoln Logs available today say they are the same. I haven't bought any anywhere yet, but what I see here in your add looks almost identical to the log sets I had and loved. I am SO happy to run across them!! I hope to purchase the large set in the near future, when my budget will allow for it!! Thank you!! Bought these for my grandsons as an Easter present. Great product! Well made, alot like the Lincoln logs I loved to play with as a kid! Fabulous product! It was my little girl's favourite Christmas gift. Ella and Daddy have had hours of fun.